Planning for the inauguration of the universitys 10th chancellor will culminate Wednesday in a celebration with food, music and top-secret things. Chancellor Victor Boschinis inauguration Wednesday will cap off more than six months of planning by faculty and staff. Margaret Kelly is keeping her fingers crossed. 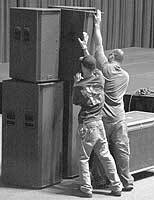 Ryan Meagher and Jeramy Tuggle, employees at Eagle Audio and Lighting, set up audio equipment for the chancellors inauguration ceremony. The inter-department celebration will expose students to different cultures through concerts, art and plays. The university will send parents brochures and encourage them to share in their childs college search. Last week, a California atheist argued to the Supreme Court that the daily recitation of the Pledge of Allegiance in his daughters public school classroom is unconstitutional. In question is one of the biggest church-state issues the high court will face this year. As Americans, we are in the middle of an era of political turmoil. The upcoming election has brought numerous issues to the forefront of our attention. I, along with many others, feel strongly about these issues. However, I think we should all take a break. Take a second to stop being angry or defensive and focus on something less serious. Stop and smell the flowers  TCU flowers that is. As one part of Brooke Tulls career nears its end, she hopes another awaits her in the professional ranks. TCU senior Chase Johnson is on the list of 36 players who have been named to the preliminary 2004 Rimington Award Watch List, which honors college footballs outstanding center.